We got a comment for the post on Gluten-free Pasta. Robbie mentioned raw food. The raw food movement makes a lot of sense, because, duh, you are eating the whole food, nothing processed. It’s a great idea. Just not for mushrooms. Here’s why. As you can tell from the site, I’m a bit of a mushroom nut (heavy on the nut). Mushrooms are fabulously versatile, from medicines, to dyes and inks, and yes, even paper. O, and food. As a food source though, mushrooms have one big problem: monomethylhydrazine. MMH is most commonly found in rocket fuel. Many cases of “mushroom poisoning” can be attributed to this chemical. That’s the bad news, here’s the good: MMH is a volatile organic compound, so cooking drives it away. Pay close attention to that word: Cooking. Never, ever eat raw mushrooms! Any mushroom. That includes those white button mushrooms you buy at the grocery store or get on your salads in a restaurant. There are two types of exposure: Acute and Chronic. ‘Acute’ isn’t talking about the cuteness of the exposure. It means ‘once’. ‘Chronic’ means ‘daily’. Low level acute exposure to MMH results in nausea, stomach cramps, and diarrhea, while severe poisoning can result in convulsions, jaundice, coma, or death. Clinical testing of chronic exposure to 2 and 5 ppm MMH in rats have shown a mortality rate of 2-2.5%. Other symptoms include lethargy, loss of fur, and slower growth rates in young animals. In other animal tests, dogs developed photophobia due to changes in the nictitating membranes of the eyes; dogs, rats, and monkeys showed dramatic decreases in hematocrit values, splenic hemosiderosis (enlargement of the spleen due to iron overload caused by accumulation of hemosiderin), and other nastiness. MMH has also been shown to be carcinogenic in small mammals. 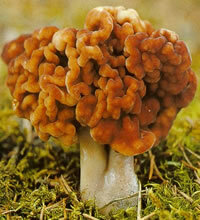 The mushroom that has the highest concentration of MMH is the False Morel (Gyromitra esculenta). This mushroom is only edible if it has been cooked thoroughly, and then, by all accounts, it is quite tasty. I heard a sad tale in one of my mushroom club meetings. An old man in Europe loved False Morels. He would get his wife to cook them. He would sit outside while she worked over a hot stove in their cottage. He had a nice meal, while his wife keeled over dead. The process of cooking caused the MMH to evaporate, where wifey breathed it in. 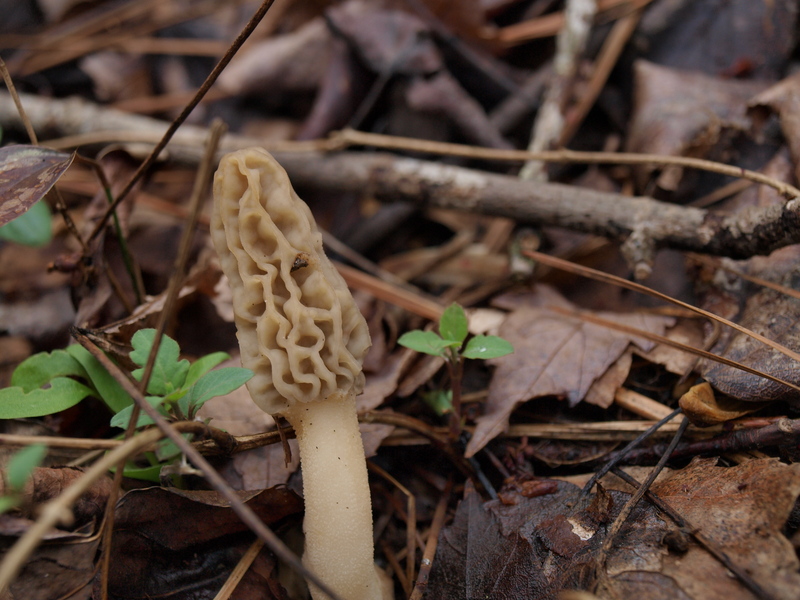 Here is a picture of the False Morel. I didn’t take this picture. I’ve never actually found a False Morel! The point of scaring you? Don’t eat mushrooms raw! Cook them first. Our favorite way is with butter, garlic, and white wine. Since MMH is a volatile organic compound, heating or drying drives it off. Meaning that edible mushrooms are absolutely safe if they have been dried or cooked. The next time you are served raw mushrooms on a salad, send it back to the kitchen and ask for sautéed instead!